We ask businesspeople where they lose out to competitors’ corruption. One of the biggest corruption stories in the world this year was the allegation that Walmart paid bribes totalling US$24 million in its Mexican operations. It makes you wonder how many other companies lost out because of those bribes. A new survey gives us some idea. Almost one in two businesspeople surveyed in Mexico (48 per cent) think they have lost business because of bribery. In 2011, Transparency International carried out a survey of businesspeople in 30 countries worldwide. These countries are from every continent, each with different levels of income and private sector development. We asked between 82 and 114 businesspeople from each of these countries for their views of corruption and anti-corruption. For more details on the businesspeople and company sizes surveyed in each country, please take a look here. The results found that 27 per cent, or more than one in four businesspeople surveyed, think that they had lost business in the last 12 months due to bribery. Clearly, for many businesses around the world, bribery and corruption present a very real cost. Companies bribe to win contracts, speed up bureaucracy and avoid the rules – or change them. They do not just do this by passing a brown envelope (see here the more sophisticated means of passing envelopes), but also through more indirect financial contributions that are intended to influence procurement processes and policy makers. Looking at the results for each of the countries surveyed, we must also consider how the perspectives of the businesspeople surveyed can vary. The sample of businesspeople surveyed varies across the 30 countries in terms of the sector they operate in, their size, international exposure and so on. We must explore these results with an appreciation for the varying contexts and perceptions of the respondents. Respondents have access to different levels of information about the way public contracts are given out. They work in environments where the level of media activity exposing corruption cases can vary. The Corruption Perceptions Index which scores and ranks countries based on perceptions of corruption in the public sector. 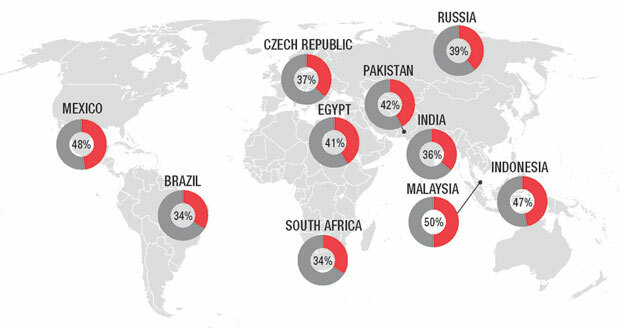 The Global Corruption Barometer which captures people’s experiences paying bribes for basic services. These scores do show us, however, that this impact of bribery in the private sector can be felt anywhere. The extent to which bribery, as opposed to merit, is used to determine who gets a deal, is worrying not just for businesses (and investors), but to all of us that are interested in achieving the most efficient and just outcome for our economies and societies. Any company that wants to do business globally should be glad that more governments are prosecuting companies for bribery, as a new Transparency International report shows today. By country: Businesspeople who think they failed to win a contract or gain new business in the past 12 months because a competitor paid a bribe. You can see the full results on 10 September, when we will be making the answers to these questions available online in a new interactive website, which will allow you to compare the data across countries, sectors, gender of respondent and more. The results also varied across sector. More businesspeople in the telecoms sector believed that they had lost business due to bribery, than in the agriculture sector, for example. And this is just one of the questions we asked the businesspeople. We will publish some of the other findings throughout September. Have a look at the data and tell us what you think.